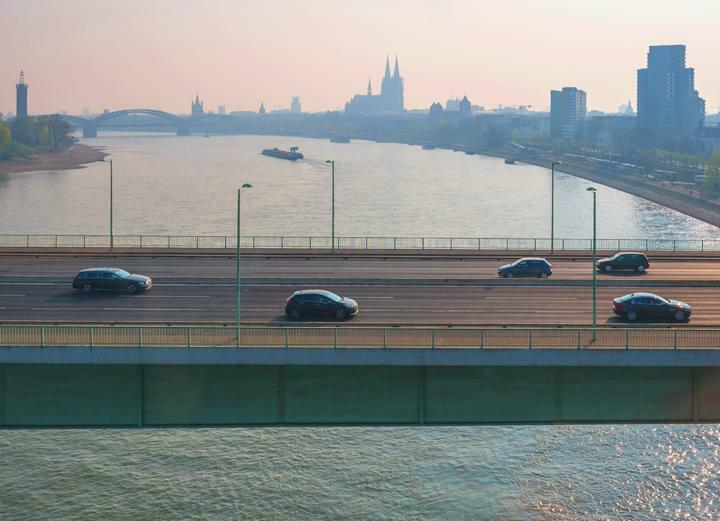 Discover the Rhine metropolis Cologne with a rental car and experience the Rhineland culture. With Driveboo you can compare easily the offers of car rental companies and save money when renting a car. Various vehicle categories are available for rent in Cologne, from small cars such as the Fiat 500 to luxury cars such as the Mercedes S-Class. Simply rent the car in Cologne that best suits your needs. In Cologne, tourists and business travellers can look forward to an enjoyable stay. The famous city in North Rhine-Westphalia is known nationwide for its exuberant carnival celebrations as well as the Cologne Cathedral. But the city of Cologne also has much more to offer. In order to get to know and use all the exciting and interesting sights and leisure activities in Cologne, visitors are best advised to book a rental car. A popular pick-up station for the rental car is the nearby airport. 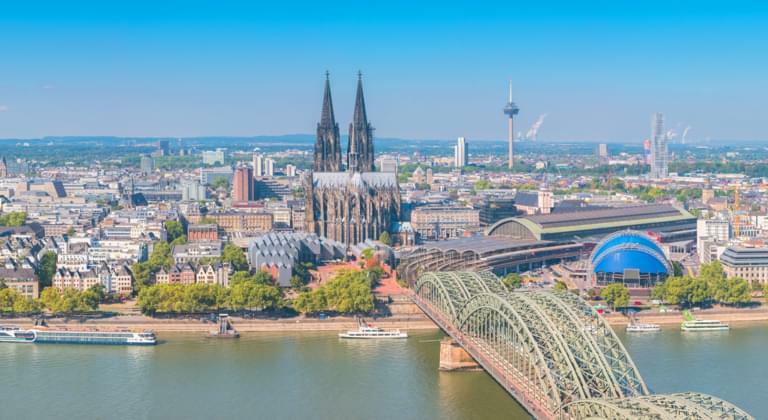 The airport of Cologne is located on the outskirts of the city, so that the city centre and many interesting destinations in the surrounding area can be reached quickly. There are also several car rentals and pick-up points in the city area where you can rent a car cheaply and comfortably. By using the Car rental price comparison you can book your car rental cheaply and safely. Please note the procedure for returning the rental car. When returning your rental car at the Cologne car rental office, simply follow the contractual rules laid down in the rental terms and conditions. No matter whether you want to hand in your rental car at the airport or at one of the stations in and around Cologne, make sure that you adhere to the drop-off point, return time, return date and return station - as listed in your individual offer. Simply start the Car rental price comparison and convince yourself of our special offers. With your rental car you are flexible and independent of public transport. In this way, you can discover Cologne and its many highlights for yourself. The imposing Cologne Cathedral is the unmatched landmark of the metropolis and one of the best-known buildings in North Rhine-Westphalia. With a height of 157 meters it is the third highest church building in the world. The Roman Catholic Church, a UNESCO World Heritage Site, was built in the Gothic style and is said to house relics of the Three Kings in a shrine. Therefore, it is an important Christian pilgrimage destination. The cathedral was built in Gothic style - typical for this are the two spire towers that characterize the building. In front of the cathedral is a pedestrian platform with a wide staircase. Visitors should park their rented car in one of the multi-storey car parks or in the surrounding area, around the cathedral. Depending on the direction from which you approach the cathedral with your rental car, you should bear in mind that the three-arched Hohenzollern Bridge next to the Cologne Cathedral is only open to railways, pedestrians and cyclists. In order to avoid annoying procedures, it is therefore worthwhile for non-local residents to book a navigation device when booking a car with their car. In addition to the cathedral, Cologne offers many other sights worth visiting. After all, the city is already more than 2000 years old and looks back on an eventful history. For example, you can visit the high-medieval city wall and in Zeughausstraße you can see the Roman tower. The tower belongs to the former Roman city fortification. In addition, numerous churches dominate the townscape. This includes the Basilica of St. Kunibert, the early Romanesque church of St. Pantaleon, the Gothic St. Peter's Church and the baroque church of St. Mary's Assumption. 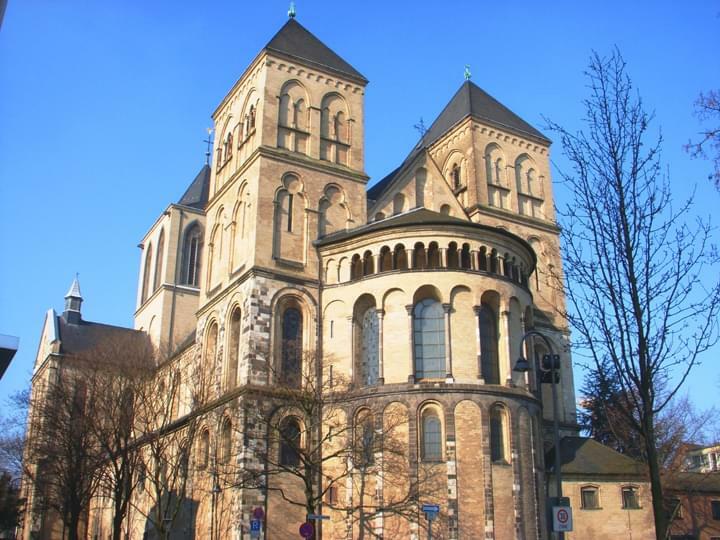 Near Cologne Cathedral stands the large Romanesque church Gross St. Martin with its monumental crossing tower. The synagogue in Cologne also catches the eye with its beautiful building in the neo-Romanesque style and its large window rosette. Other exciting sights such as Cologne's city hall with its octagonal 'Ratsturm'. These are also worth a visit and can be easily reached by rental car. In the Belgian Quarter and the Südstadt, visitors can also admire many Art Nouveau buildings. The lively residential areas have turned into popular trendy neighborhoods home to modern boutiques, cafés, clubs and galleries. Cologne has something for every taste: connoisseurs visit the Chocolate Museum, located on the Rhine and one of the most popular museums in Germany. The Museum Ludwig is the perfect place for anyone interested in contemporary art. Art in the open air can be found in the sculpture park. The City Museum, the Archaeological Zone and the Wallraf-Richartz Museum are also worth a visit. The densely populated Ruhr area with its many-sided cities can be explored conveniently and cheaply with a rental car. In the immediate vicinity of Cologne, for example, it is worth visiting the neighbouring city of Leverkusen, where Morsbroich Castle and the Reuschenberg Game Park are located. One of the most popular destinations in North Rhine-Westphalia is the former electoral residence city of Brühl, since it's home to the popular leisure park Phantasialand. Travellers should reserve their rental car in advance and choose the best deal through the DriveBoo price comparison.